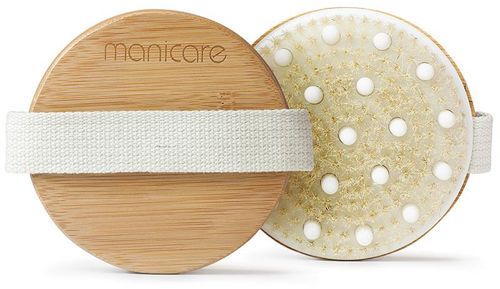 Manicare Dry Body Brush is a palm-sized dry body brush that helps to reduce cellulite for smoother, softer skin. The dry body brush assists in stimulating and increasing blood circulation, while exfoliating dry skin and promoting skin elasticity. The brush is best used before showering with long, upward circular movements, brushing towards the heart. Brush for three to five minutes until skin becomes slightly rosy. Clean the brush with soapy water after each use and leave to dry. this brush is great for dry skin exfoliation and plumping to reduce the appearance of cellulite. I'm guilty of never being able to use the brush for 3 weeks straight to see the full cellulite-reducing effect, but every time after i use it my skin is soft and smooth and doesn't look as dull anymore. I dry body brush before I shower and I literally cannot live without this. I once left it at home and was away for 6 months and bought about 5 different brushes trying to find one as good as this, but couldn't find it. The bristles are strong and don't shed, plus the little massaging nodes are nice and firm and give a good massage to the skin. The size is perfect and fits into the palm of my hand for easy use, though for me the strap at the back is too wide so I just grip the brush by the sides. I start from the feet in upward strokes, towards the heart taking care not to apply too much pressure where the lymph nodes are. I'd highly reccomend this if you are in the market for a body brush. Wash in warm water with a couple of drops of tea tree oil and dry in the sun. I was surprised at first how stiff these bristles are. There is a combination of natural bristle and rubber 'fingers' on this easy to hold disc brush. As they are so stiff, I find it makes fast work of brushing my skin all over the body - which is exactly what I want. I like that it is fast! It's great to use before the shower on dry skin as a dry body brush or in the shower with some shower gel for a more cleansing, pampering treat. Rinse and leave to air dry after each use. Fast work on the body. This is a round, dry body brush which is great for increasing circulation, removing dead/dry skin and reducing the appearance of cellulite. The brush contains bristles and white pieces of rubber which help massage the skin. I like that it comes with a handle which allows me to control the brush and really get to the hard areas on my upper thighs and beneath my bottom. My skin definitely looks and feels a lot smoother. The size is also great which makes it perfect for travelling. And it's lightweight too! My mum gave me this in a gift basket and I am glad she did, because it is not something I would have thought of buying myself. I have never heard of dry skin brushing and was intrigued to read about the benefits. This brush is awesome, it's soft and gentle, doesn't scratch and even massages as you use it. I sit on my behind too much and the backs of my legs and bottom really need some improvements in skin tone and circulation - I really find this helps. For some reason it has also helped with my dry skin - I thought it would make it worse at first and was a little hesitant to use it because it's not only dry but sensitive. Now I have less dry patches on my skin, hardly any white flaking and less ingrown hairs (a very annoying long-term problem for me). I think it is really sloughing off the dry dead skin and that is improving things all around for me. Wish I had tried this sooner and it is a natural product - I have been using chemical products to combat the dryness, the ingrown hairs and the circulation issues. My new favourite product for my body, this brush is great! Instantly after use my skin feels extremely soft and smooth, and after continued use my skin has become healthier looking and stays smoother for longer even when I'm busy and forget to use it! Your go-to guide for a winter pregnancy.